After a weather-related delay in February, the new half-mile Vesper Trail connecting Vienna and the Spring Hill Metro station is now open. The trail is part of a series of necessary transportation improvements identified in the Tysons Metrorail Station Access Management Study. The trail is federally funded. 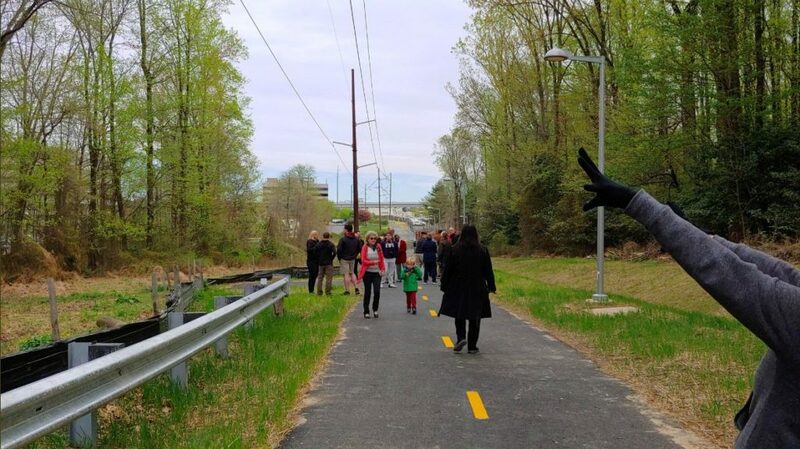 At the grand opening this morning (Tuesday), Board of Supervisors Chair Sharon Bulova and Hunter Mill Supervisor Cathy Hudgins spoke at the grand opening and emphasized the new trail’s crucial role in connecting Vienna residents to Tysons transit and retail. (Updated 9 a.m.) — Metro ridership may be in free fall overall, but at least in the Tysons area ridership is continuing to climb. Three of the four stations in the Tysons area saw increased ridership in the last few months of 2018 as compared to the year before. The McLean Metro station saw the largest increase in ridership, rising 18.6 percent over the last year. The station is located close to the Capital One headquarters, which opened late last year. The Greensboro Metro station, meanwhile, saw an increase of 10.8 percent, while ridership at the Tysons Corner station increased 3.9 percent. 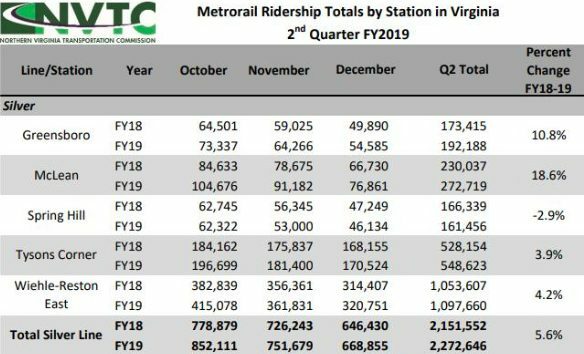 The stats, compiled by the Northern Virginia Transportation Commission, compare ridership in October, November and December of 2018 with the same period in 2017. The Wiehle-Reston East Metro station saw the highest overall ridership among Silver Line-only stations, with over 1 million rides during the three-month period. The station is the furthest point west on the Silver Line. The only Tysons stop with a decline in ridership was the Spring Hill station, which declined 2.9 percent. There is very little in walkable proximity to the Spring Hill station, though plans are in the works for several new developments east of the site and a few to the west. Stations on the Orange Line did not fare as well. While the West Falls Church Metro station saw a 4.1 percent increase in late 2018 as compared to late 2017, Dunn Loring and the Vienna Metro stations saw a 1.1 and 1.4 percent respective decrease in ridership. Professor Frank Shafroth, director of the Center for State and Local Leadership at George Mason University, told Tysons Reporter earlier that the high Metro ridership in Tysons is likely a result of the area’s notorious traffic, though car remains the more popular for commutes than Metro. 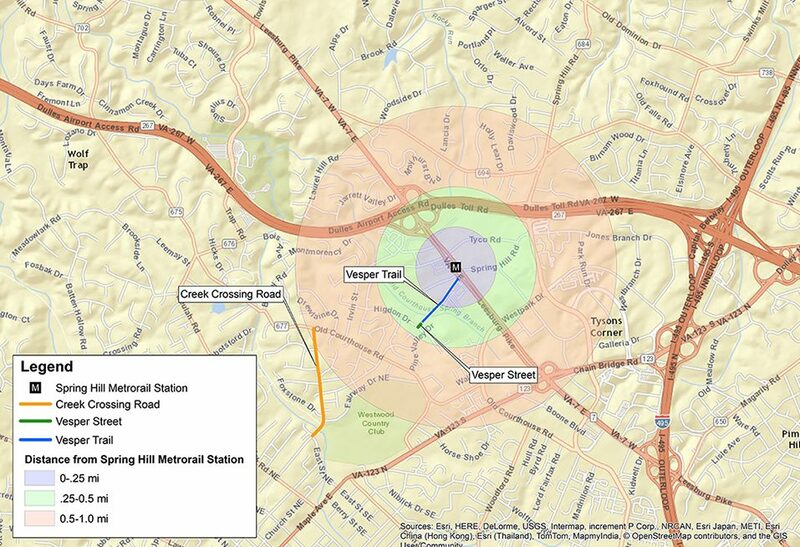 A new development plan could bring new housing, hotel rooms, office space and retail to the area around the Spring Hill Metro station in Tysons. 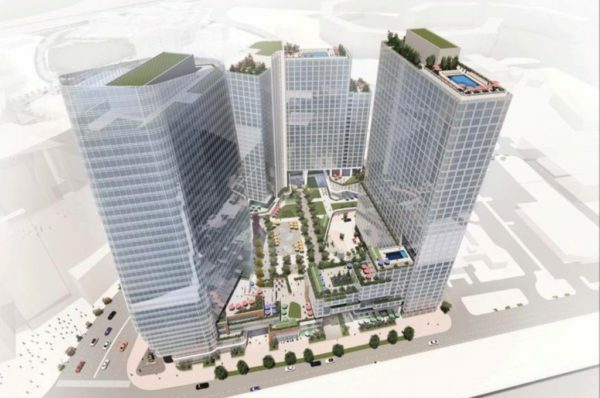 The plan, which calls for between 775 and 1,225 residential units, some 700,000 square feet of office space, and perhaps a 350-room hotel, would be located down the street from the proposed View at Tysons project, the Washington Business Journal reports. 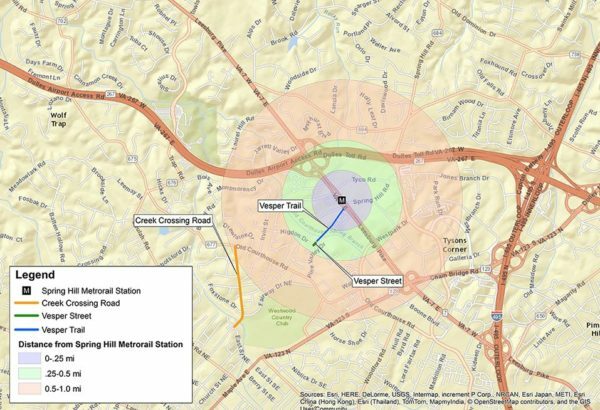 There’s a new proposal for a 5.24-acre site just down the street, at the corner of Leesburg Pike and Spring Hill Road, that would bring an additional 2 million square feet to the Spring Hill Metro area. And this one features a 2-acre piazza. 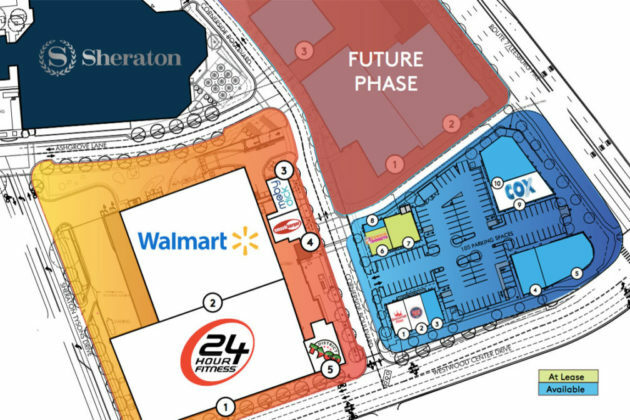 The Piazza at Tysons would replace Schmitz Exxon and a neighboring retail development currently home to a Starbucks, Tile Shop and Ethan Allen furniture store. 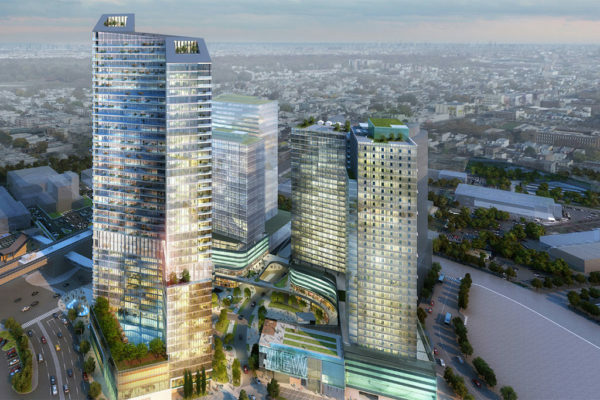 Tweaks to The View project proposed in Tysons include plans for a new performing arts center, according to the Washington Business Journal. The development, which would include the region’s tallest building, is part of a sweeping series of new developments planned to transform Tysons east of the Spring Hill Metro station. 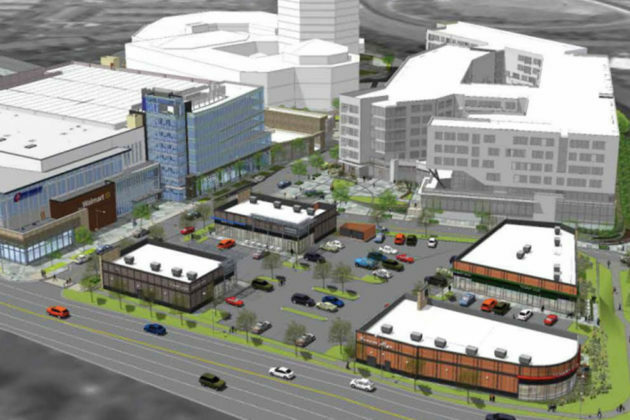 According to the Business Journal, the new proposal includes ground-floor retail beneath a 199-seat black box theater. Above the theater would be an outdoor amphitheater, and three floors of office space above that. 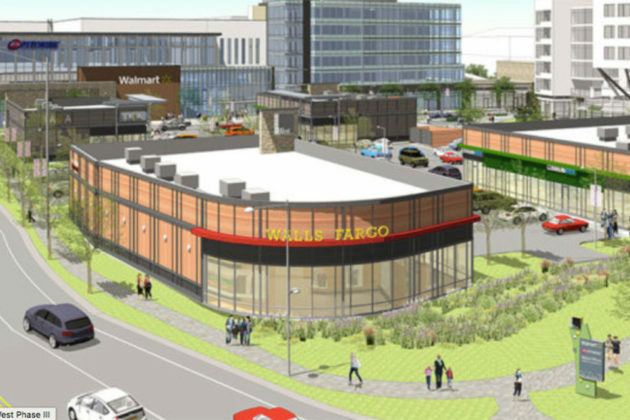 A previously proposed 500-seat theater is not part of the project. The Vesper Trail, a new half-mile bike and pedestrian trail between Vesper Street in Vienna and the Spring Hill Metro station, officially opens Friday (March 1). 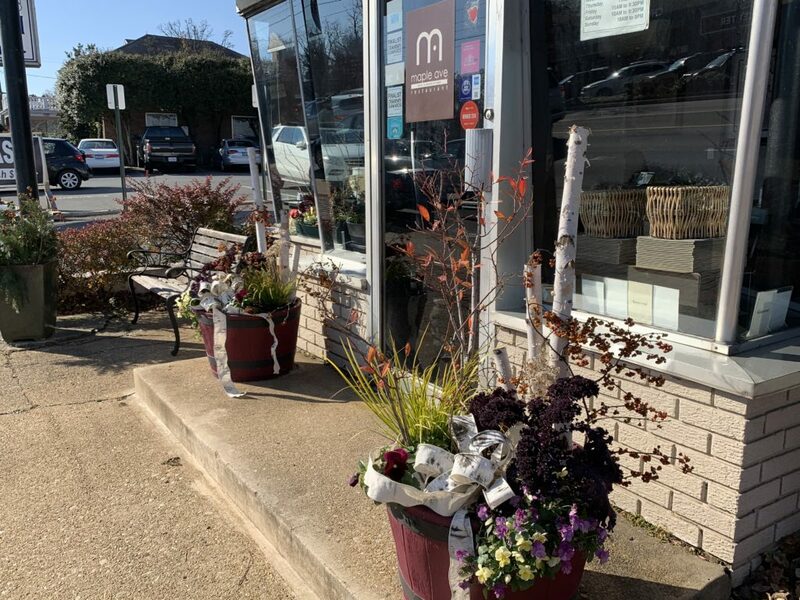 The trail links the residential neighborhoods in northeast Vienna to the area around the Metro station, which is the site of several redevelopments with significant new retail and residential planned for the area. The trail passes through Raglan Road Park, a small forested area separating Vienna and Tysons. A ribbon-cutting ceremony is planned for 10 a.m. at the Vienna entrance to the trail. The Fairfax Alliance for Better Bicycling will be hosting a ride from the Vienna Community Center (120 Cherry St) at 9:30 a.m. to the trail in time for the opening. After the event, light refreshments will be served and a bike mechanic is scheduled to be available for free tune-ups. 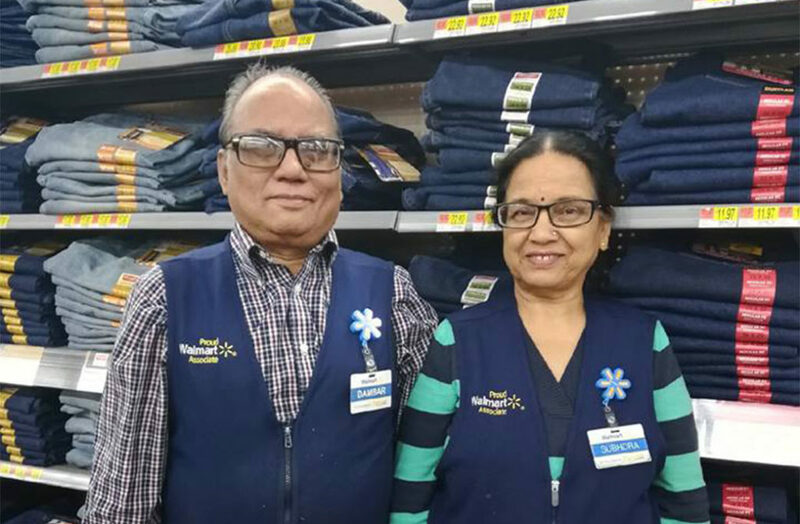 The Walmart near the Spring Hill Metro station in Tysons is going through a lot of changes, but if there’s a source of stability in the store, it’s Dambar and Subhdra. The couple was featured on the store’s weekly “Meet the Team Tuesday”post on Facebook, which said that the couple is one month away from celebrating their 53rd anniversary. Dambar joined our team in January 2014 and is a proud hardlines sales associate. Subhdra joined in April 2015 as an apparel associate. They are both into food and will be celebrating 53 years of marriage this March! The Walmart also recently hosted a “Stuff the Bus” event to benefit the Committee for Helping Others in Vienna. 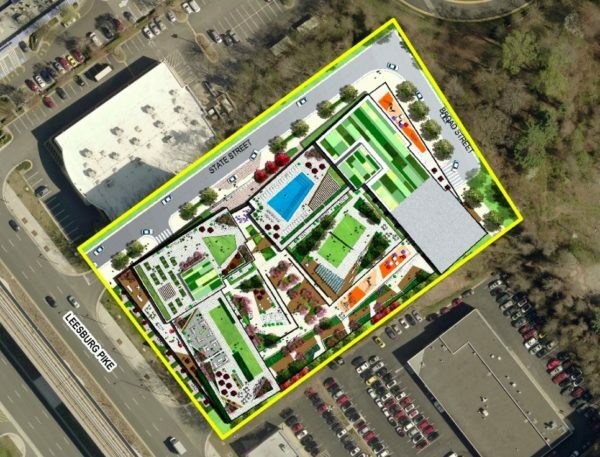 It’s not as high profile as Clemente Development Company’s The View development planned for the Spring Hill Metro area, but the nearby Evolution development could be exciting for affordable housing advocates. According to the application overview, the building would include 1,400 multi-family units in a high-rise building. All of the housing in the building would be workforce dwelling units — defined by Fairfax County as housing affordable to people making from 70 to 100 percent of the area median income. The contact phone number listed for the project is inactive, but the housing is likely part of a requirement from Fairfax County that residential developments set aside 14 percent of units in a residential development as affordable, or 16 percent if the units are being constructed off-site. According to Fairfax County Public School documents, the new building could add as many as 157 students to Spring Hill Elementary School. Details on the project are still scarce. The application was submitted in late 2017, but staff at Fairfax County Planning and Zoning say little progress has been made since then, as the developer remains mostly focused on The View. 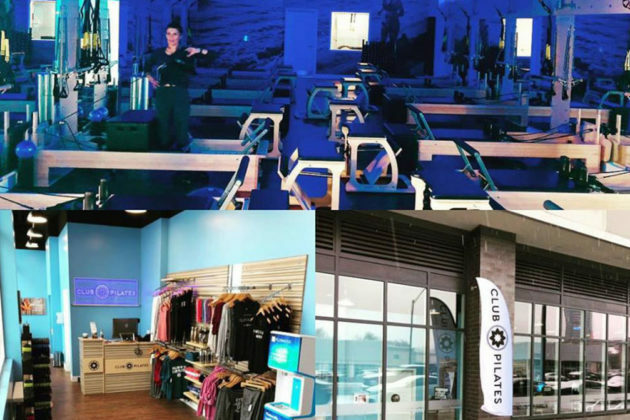 After two months of a “soft-opening,” Club Pilates in Tysons is finally ready for its grand opening this weekend. The new workout studio is in the Adaire apartment building at 1521 Boyd Pointe Way, near the Spring Hill Metro station. On Saturday (Jan. 19) and Sunday (Jan. 20), attendees will get to try out a complimentary 30-minute Pilates class. Booking for the free class is available online. Pilates is a type of full-body workout aimed at building balance, strength, mobility and flexibility. The workout utilizes specialized equipment, like springboards, that often aren’t available at Pilates classes offered at other gyms. 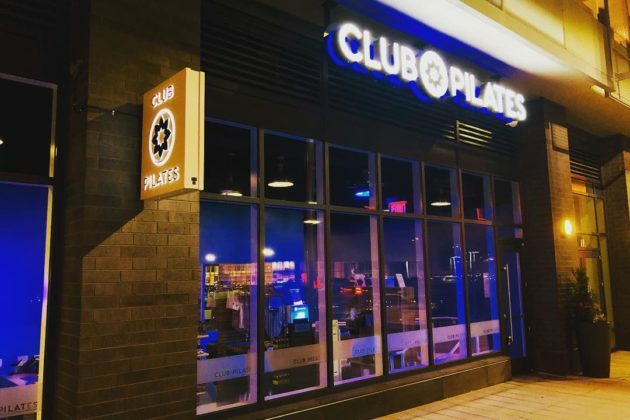 Club Pilates in Tysons offers four ranges of classes aimed at various levels of experience with a variety of membership packages, ranging from one workout per week to an unlimited annual membership. 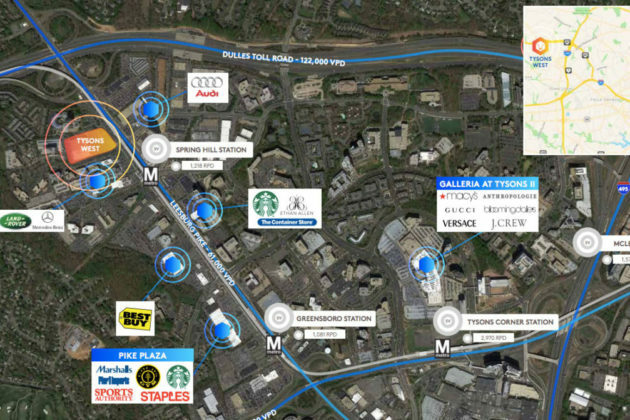 In addition to the free classes, the new Tysons location will also have raffles and item giveaways with various vendors. All merchandise in the store will be discounted 20 percent all week. Parking at the location is free in the Adaire building garage.